When you are looking to make a real dent in your financial future, it makes sense to open up an IRA. The IRA is one of the most flexible and potentially lucrative accounts to park your money in, assuming you have the right access to learning about investing and all of the IRA benefits. If you have a 401K at your job, there can be advantages to that, but it can be frustrating to leave the investing and managing of the account to someone else. The Roth IRA can be another alternative, but that means you are pay taxes now and taking a chance that the rules will stay in place for when you retire. The real bonus of an IRA account is that you can take control of your financial future. The control is with you, so the responsibility is with you. It helps to learn as much as you can about investing basics, so that you can make your IRA work to its full potential. An IRA that just sits there and is passively invested might not be your best option. You could be leaving money on the table. Take some investing classes online and read as many investing books as you can. Find anything you can from Warren Buffett and his company, Berkshire Hathaway. He has built the most successful investment firm in the world, with patience and practical rules for investing. Read what you can by Jack Bogle, who invented the index fund and created Vanguard, perhaps the most widely used investment service in the world. When you first learn how to trade a stock, it can be very exciting. You are researching a company, finding out about its business fundamentals and bottom line, then putting your money where your research is. 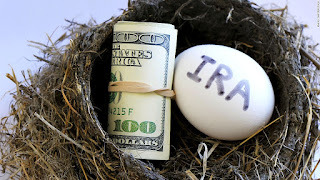 When you fund an IRA account, you can deduct those contributions from your taxes. You will have to pay when you withdraw as a retiree, but you can benefit if you expect your overall tax rate to be lower when you are in your golden years, than right now. The IRA is a great tool for high-income earners in the early phase of their career. Just as important as learning how to invest your IRA funds, is the saving and setting aside of those funds in the first place. Learning how to budget your money now is essential to getting control of your finances. Learn how to cook for yourself, so you do not waste money at restaurants. Take a moment to look at your weekly and monthly spending and try to cut where you can. Do you really need those $5 lattes? If not, cut that expenditure out of your budget and put that money into an IRA. It might not sound like much, but it can really add up over time. The key to being a good investor and being in great shape financially is discipline and direction. You need to set goals and figure out what you need to toin order to meet those lofty goals. That is what is required if you want to be safe and solvent in your later years. Starting an IRA now is an important part of that process.